Pure has unveiled the Evoke Mio by Orla Kiely, a custom-designed DAB and FM portable radio. 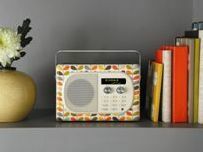 Orla Kiely – who's apparently a renowned fashion designer – has, according to Pure's release, "applied her instinctive love of pattern, colour and texture to PURE's iconic EVOKE Mio digital radio and dressed it with her signature stem print." So what you get is based on the Pure Evoke-1S digital radio finished with a mirror chromed handbag style handle, walnut veneered cabinest, cream fascia and stylish leather tag. We're going to go out on a limb and suggest that this is not pitched at the average technophile man. "I love to create quality and functional down-to-earth designs that integrate colour, pattern, texture, graphic control and rhythm that continually work and rework together," said Kiely. "Radio is also a passion and Pure's Evoke Mio was the ideal product to apply my signature stem design to, as it is both practical and a thing of beauty that will complement any home interior design and sits perfectly within my homeware range." The Evoke Mio by Orla Kielywill be on the shelf exclusively at John Lewis with a UK release date of early November and a price tag of £150.